Rising from the ashes and evolving as a phoenix, that’s the story of IPDC Finance. It was just a few years ago, under the charismatic leadership of Mominul Islam, when just another NBFI with a stressed NPL restructured itself completely to only stand on its own. IPDC proudly claims itself as the fastest and strongest Non-Banking Financial Institution of the country. Realigning its focus to youth, women and underserved areas, IPDC promised to be the most passionate financial brand in the country. Amongst the many shades of blue, green and yellow representing the giant depositories who are trying to appeal to the people, IPDC beamed in a very unconventional magenta hue in the country with a very eccentric pay-off line “Jaago Ucchashe”. It frames a notion of living that surpasses the usual bounds of life. Mahzabin Ferdous, famously known as Next generation digital marketing innovator; ATL, BTL and engagement expert joined IPDC at the end of 2016. Following which one of the most magnificent rebranding in the history of financial industry took place, taking the nation by surprise. Since then, she relentlessly outperformed herself in all the challenges across activation, digital and public relations. Her awe-inspiring spirit to accomplish many first of kinds projects has been one of the driving factors behind the promising brand image that has been built of IPDC today. She instils her practical expertise in brand development, management, awareness and excellence among her peers. Joyanta Sen, knows just the right mix of social media marketing. Each brand campaign strives to bring forth a cause-driven theme rather than a customary wish post on special days. On Independence Day, IPDC created a repository within a microsite called Bijoye Jadughor. It showcased common people’s endeavours and freedom of unbound life. To let people, celebrate Eid at hometown, IPDC give away tickets to journey back home under the Eid Ucchash campaign. The 10 Maash 10 din deposit campaign to celebrate Motherhood, while a series of post on different dialect from different region on International Mother Language Day unfolded the rationale of expressing oneself best in their own language. Flamboyant events are a signature of IPDC’s groundbreaking initiatives led by him. Be it Unsung Women Nation Builders Awards in association with The Daily Star to accredit the woman change makers from the grassroots or creating holistic supply chain financing eco-system in Bangladesh with Bangladesh Supply Chain Excellence Awards (BSCEA) 2018, partnering with BSCMS (Bangladesh Supply Chain Management Society). Star studded extravagant ambience of each event leaves an everlasting effect. Considering collaboration as a crucial way to broaden its net, Afifa Sultana ensures IPDC works in association with universities, media houses, independent associations to have a bigger and louder reach across the country. Setting examples in strategic CSR has been the core motivation in all its endeavors for the society. Whether it is going across the city to a remote char in Bogra and building a school for the underprivileged or supporting the old age women dwelling in Apon Nibash or opening scopes of employment by donating rickshaws and sewing machines, IPDC does not merely fulfill its CSR but believes in Creating Stories Rather. With such focused effort and excellence follows awards and recognitions. Hence, the company aim towards initiative that can be proudly endorsed nationwide and as well as globally. IPDC within a span of two proudly holds the Association of Development Financing Institutions in Asia and the Pacific (ADFIAP) Award for its extraordinary contribution in Corporate Social Responsibilities. 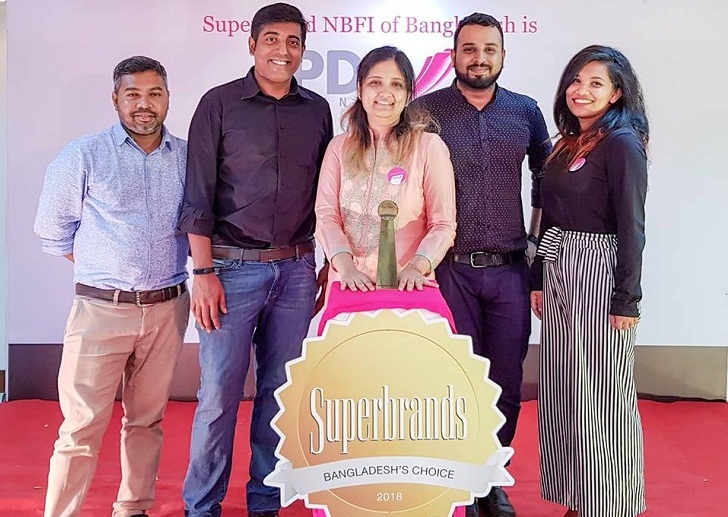 Besides being awarded for Best Presented Annual Report from South Asian Federation of Accountants (SAFA) and The Institute of Chartered Accountants of Bangladesh (ICAB). But finally, in 2018, IPDC Finance is perceived not just as a brand but a SUPERBRAND.